There we are then, London Edinburgh London 2013 complete at 02:21 in the morning of Friday the 2nd of August! A simply brilliant adventure, which I’m still struggling to properly get my head around. Sadly I took very few photos over the course of the event and haven’t yet managed to crawl through all the online galleries of other people, so I’ve knitted together this report from the official rider tracker, my Twitter feed (@Darkerside) and with some extra comments thrown in. As I get permission from various people to use their pics, I’ll add them in. 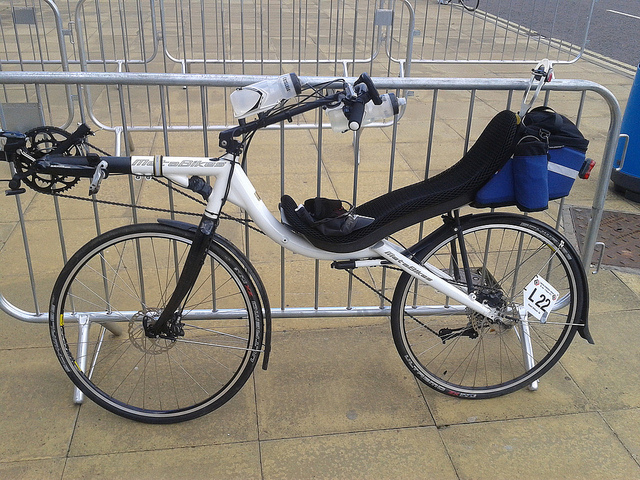 Before you start, I’ve also written a guide to the event and the various stages here, and some stuff about the recumbent I used here. 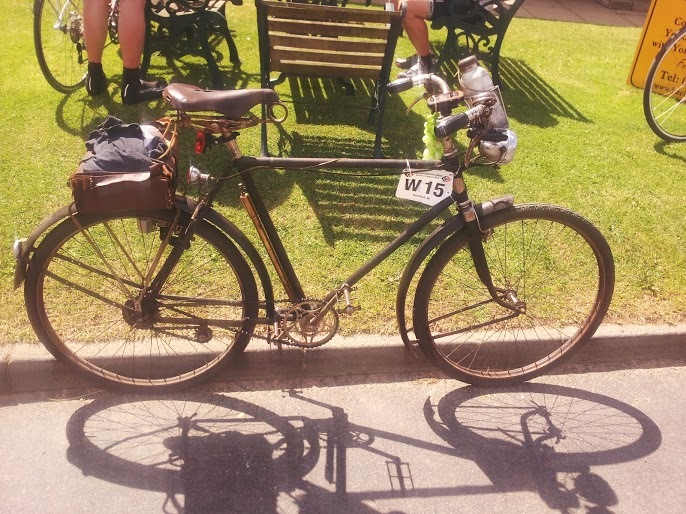 In brief, LEL is a long distance ‘audax’; a cycling event where the only aim is to complete the course above a certain average speed (a smidge over 12km/h in this case), whilst passing through certain checkpoints. Cycling above that required average speed creates spare time for eating, sleeping and repairing any mechanical bedevilments you are struck by. If you check into a control after the imaginary cyclist travelling at this constant 12km/h, you are disqualified. Although each control contains food, beds and a degree of mechanical support, out on the road you’re on your own. Every rider is expected to carry whatever they need to ensure they reach the finish, including spare wheel spokes, tyres and tubes and lengths of chain. I was riding a Metabike in a custom configuration, with hydraulic disc brakes, carbon fibre fork and seat and a very wide range SRAM double gearing setup. Click on the picture for more info. 1,438km cycled and 10,000 metres climbed in 114 hours, 6 minutes and 24 seconds, with an average moving speed of around 20km/h. 80 200mg tablets of Ibruprofen (16 per day), four paracetamol and six Pro-Plus caffeine tablets taken. 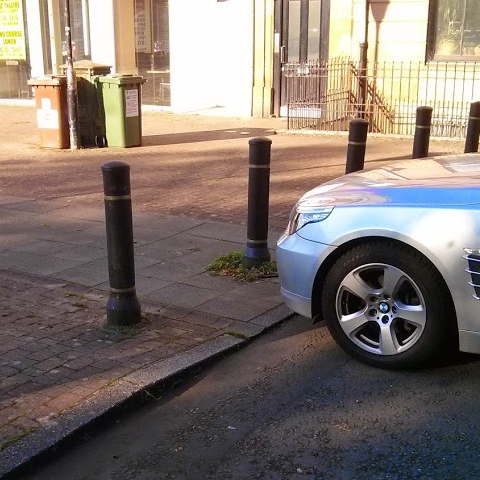 One ‘unintended dismount’, albeit whilst practically stationary. Money spent beyond the initial entrance fee: £4.37. The official map of control points, with the northbound leg being towards the west at the two loops. Click for a full route preview. Tweets are in italics, and timings from the rider tracker are underlined. @Darkerside – After mild excitement from being unable to exit the basement car park, we reach the start! A decent collection of riders decided to do the bonus ‘prologue’ stage, because what’s an extra 20km between friends? There was a nice party atmosphere as we all trundled through London on a sleepy Sunday morning, made slightly more entertaining by some unexpected road closures. We followed a group of riders who seemed to have a cunning navigational plan, and made the finish with just enough time to grab a roll before our start time. @Darkerside – Prologue complete. Nothing fell off. Result. ‘Chased down’ is maybe a little generous. I put on a brutal sprint to haul in a black velo that cruised past, and managed to stay alongside for just long enough to ask some inane question about whether he was warm. On the flat, those things are fast. Slow and steady was definitely true – my riding companion John’s knees never quite got going, which eventually proved his undoing a few days later. Sadly this meant our average was way down on the rest of the pack, and by the time we reached the control we were definitely amongst the rear markers, despite our early-ish start. @Darkerside – Quick turnaround and refuel (and, er, some satisfying weight loss on my part) and we’re off again! I’d say that most had some form of tailbox, ranging from very swish carbon-fibre jobs to rather ungainly-looking constructions of plywood and camping mat. Definitely something I’ll be looking into. Every control was staffed by volunteers – people who had given up all or part of the week to selflessly assist 1000-odd grumpy, tired cyclists to complete their personal challenges. The event wouldn’t have worked without them, and I add my voice to the many others who thank them all sincerely. I wouldn’t have got round without their help; that’s absolutely clear. Tom and Tim were part of the logistical operation shuttling the inflatable beds around in big vans to ensure that the controls could cope with the majority of riders. I passed them again on the road to Edinburgh. By this point it was pitch black on the hills, and I’d gathered up a good gaggle of riders behind the MetaBike. In the dark, the man with generator-powered GPS and lighting is king… We met Bish, a copper from Plymouth, who joined us for the next few stages, as well as Paul. Paul’s rear shifter had died within a few kms of starting, leaving him with effectively a two speed courtesy of his front double crankset. Five days later, we rolled over the finish line together, having met up again by chance at the penultimate control. The sleeping arrangements were exceptionally well run. Each control had a big whiteboard with every spot marked on. You’d ask for a bed and the time you wanted to wake up, it would be marked in, and a few hours later a volunteer would rouse you from your slumbers. On the down side; the sounds and, uh, thickened air encountered within a large room full of 300 sleeping cyclists will stay with me for a very long time. 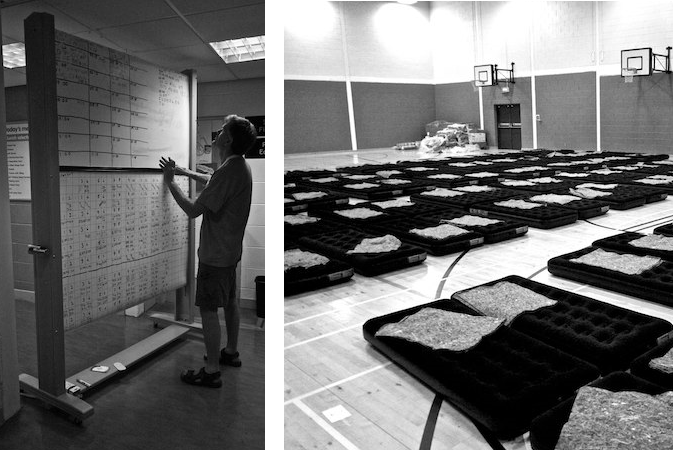 The whiteboard and beds at the Edinburgh control. Photos by Dave McCraw – click for the full album. This was one of only two times we got properly wet, just catching the tail end of a storm twenty minutes from Thirsk. Hailstones were unwelcome, but the rain itself was quite refreshing. Earlier on we met a chap called Drew, riding a 1920s French device where pedalling backwards provides a lower gear than pedalling forwards. The thing weighed an absolute tonne, and it was a spectacular achievement to reach the St Ives control southbound before the heat and headwind finally put paid to his ride. Notice the grapes on the left handlebar. The chainline is ingenious; both top and bottom of the front cog go the the tops of two different rear freewheels, with an additional idler there to untangle everything and provide tension. The dynamo lighting was apparently functional, but as the bottle dynamo provided more drag than the brakes was left off in favour of a more modern alternative. 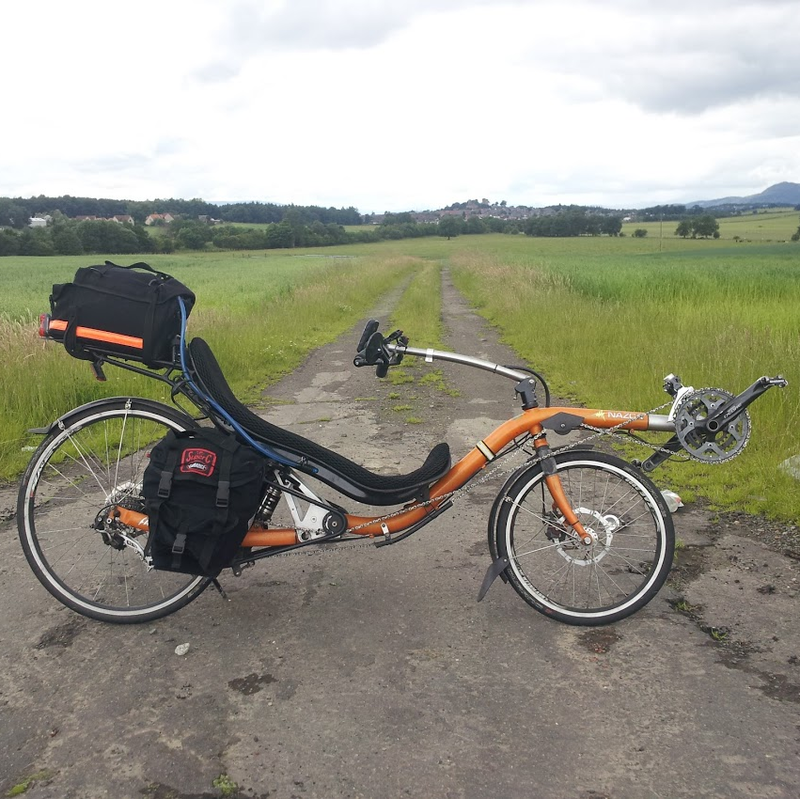 @Darkerside – Right, off to Moffat. Hold on Scotland; I’m on my way! This very nearly caused me to fall off. Whilst trundling uphill next to a fence, the head of something big and shaggy suddenly appeared a few feet away, clearly seeking the greener grass on the other side. As the eyes lit up in my headlights and the beast let out some kind of stifled ‘blaaaart!’, I screamed manfully and swerved to the opposite side of the road. Sleep deprivation, darkness and the countryside. Kids; don’t do it. Thanks to David from Laid Back for sorting me out with another tube. The Nuun tablets worked brilliantly the entire way to replace all the various salts lost through sweat; I eventually settled on half a tablet per 750ml of water as the ideal mix for me at my not-particularly-fast speeds. Highly recommended, and the different flavours broke up the monotony of constant drinking. @Darkerside – Right. Edinburgh. Let’s be having you. Brilliant stage. Sharp climb out of Moffat resulted in a more-or-less continuous gentle descent for the next 30km, which my slightly refreshed legs made the most of. I also managed to tag on to the back of a tandem for a little while, so hovered around the 40km/h mark for a good 15 minutes. Max speed of 64.4 km/h on the descent into Rosewell. Greeted by a variety of familiar faces at Edinburgh, including David (with the Nuun) and Uberuce (who had had less sleep than me over the past 48 hours). Leaving Edinburgh control in high spirits for the journey south. Photo by Uberuce – click for the gallery (and a photo of a rather juicy Moulton). The fingerless gloves have left me with spectacular hand tanlines. This was a pretty brutal leg – short, but with endless long climbs on the poor road surfaces that make life on the un-suspended MetaBike particularly uncomfortable. On the plus side, the Traquir control offered a tasty combination of cake, coffee, biscuits, whisky and (the rider’s own) ibuprofen that considerably perked up one’s spirits. A much more rolling stage that wasn’t quite as hard work as the previous one, and with some solid, homemade food at the end. Food was good throughout, but the lentil soup here was particularly fine. The midges were descending as I got ready to leave, so I made a hasty getaway. @Darkerside – Dire stage. Lost both rear lights within 5 mins of each other, including dynamo-powered. Limped in. The lowest point of the entire ride for me. About 20km out from Brampton on the A7 in complete darkness, my supposedly bullet-proof, dynamo-powered rear light packed in. A few moments later, the batteries on my reserve died as well, leaving me with a single, weedily-glowing LED on an unlit A road. I watched my rear mirror like a hawk, jumped into the hedge whenever an HGV loomed in the distance, and eventually crawled in to Brampton escorted between two well-lit Japanese riders. No amount of fettling with wires revealed a problem, but luckily the control had a single rear light left in their stock of supplies as well as some batteries. A quick rummage around Brampton resulted in an ATM and eventually I had two working rear lights, plus the dynamo one which would work intermittently for the rest of the ride. @Darkerside – New light attached, fresh batteries all round, B&M top light…fettled with. 3 rear lights for now. Brampton was heaving with people, so I decided to push on in the darkness back over Yad Moss. @Darkerside – End of a tough day, winching into Barnard Castle at 0640. Cracking sunrise though. Sleep. 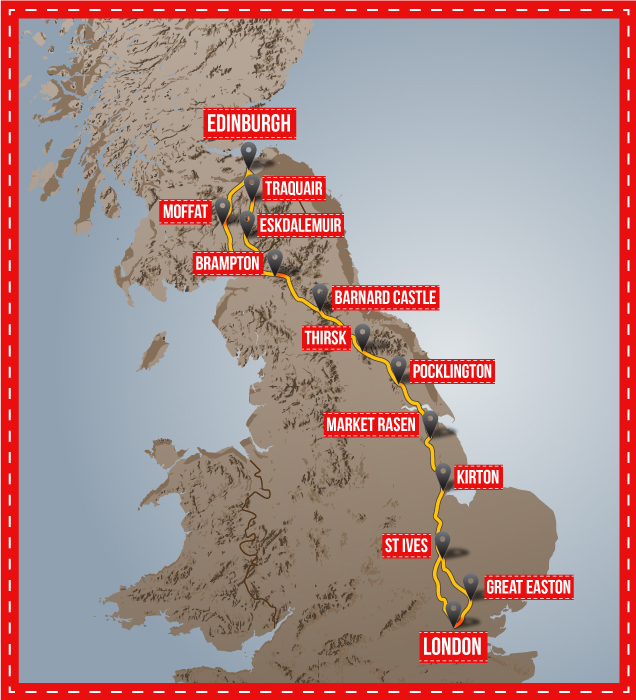 Probably the toughest stage, partly because it followed the lighting issues above and the hard ride south from Edinburgh. Average speed for the stage was a relatively respectable 17.3 km/h, but included long periods of spinning the cranks at 7-9km/h. This speed wasn’t enough for the dynamo to power both lights and the GPS, so the latter got into several sulks as the external power dropped in and out. On the descent from the top I was absolutely freezing as well as half asleep, and suffered from repeated attacks from kamikaze rabbits desperate to throw themselves under my front wheel. I also managed to completely screw up my gearing. Both gear cables had stretched slightly, which should require a simple adjustment to put right. My tired brain couldn’t quite work this out, so I set about with the derailleur limit screws and turned a basic issue into a complete balls up. Eventually I managed to secure a working lower cog at the front and nine of the ten at the back, which was enough to get me to Garry the mechanic at Barnard Castle. Another volunteer soldiering on with no sleep, Garry put everything right and sent me on my way. Huge thanks. @Darkerside – THIRSK SERVES CURRY! Instant morale boost. @Darkerside – In other news, phone battery on last legs, so official rider tracking (L22) only for time being. Despite having an extended battery and with data off and screen brightness on the minimum setting, my modern-ish smart phone just isn’t designed to stay alive for five days on the run. I managed two more Tweets before it died completely, nearly taking my ride with it when it went. Truly excellent pie, apparently from a bakery in the village. Spent a good hour here to get my mind in the right place for the next leg. Dull was an understatement. North of the Humber Bridge was OK; a good bit of up and down in the misty Yorkshire Wolds with the darkness gathering. Once we’d crossed the bridge I joined forces with two other chaps (whose names I sadly can’t recall), and we spun on into the night for 2.5 hours of dog-slow climbing. Market Rasen marked my mental milestone for the beginning of the end, and I’d planned to get an hour of sleep here before pushing on towards Kirkton and a proper rest. What actually happened was I overslept by five hours (my phone died completely before the alarm went off), was woken by a concerned volunteer at 08:10, and staggered out of the door to meet Bish (who we’d met up with on the same leg northbound). 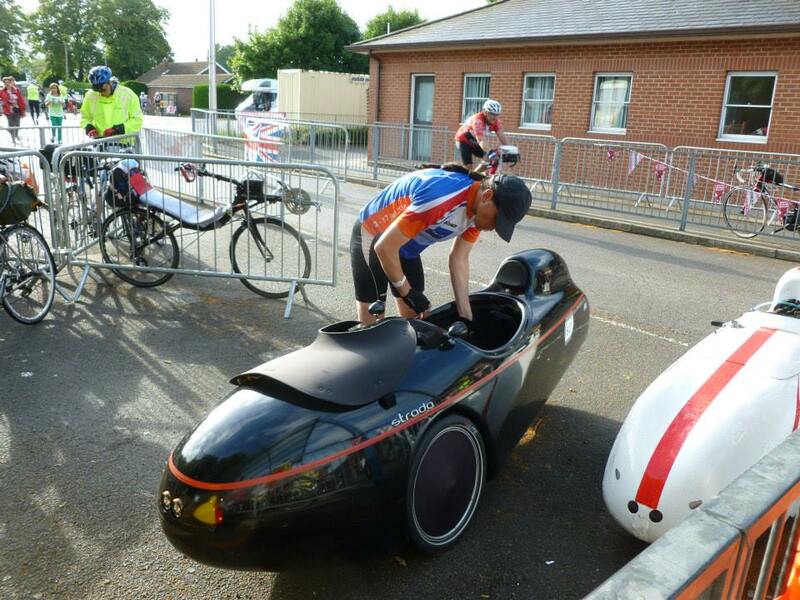 He’d just packed, again due to dodgy knees, but filled up my water bottles with his last two sachets of liquid food and wished me good luck as I sped off towards the next control, having not eaten solid food since Pocklington the night before. Kirkton reached with only 22 minutes in hand, but with a huge sigh of relief that my phone/alarm issues hadn’t resulted in a disqualification. Thursday was hideously hot and constantly into a strong, dry, gusty headwind which the flat Fens gave very little relief from. The leg from Kirkton to St Ives was more of the same, but unfortunately coincided with rush hour as well. As tetchy drivers struggled to pass the clumps of cyclists who’d formed impromptu pelotons to shelter from the wind, tempers flared. On the recumbent I tried to keep myself out of the worst of it by staying solo – I don’t get huge benefit from sitting in with uprights, and I was concerned that if I didn’t pay attention I’d end up burying my chainrings in someone’s calf. St Ives was a welcome relief, as were the cool showers on offer. St Ives to Great Easton, by contrast, was absolutely wonderful. Aside from the constant niggling fear that a mechanical issue here would effectively end my LEL, I was relaxed by the return of rolling hills and varied scenery, and the numerous small villages provided something to occupy the mind whilst the pedals turned. Despite being a long and pretty slow stage, I arrived at Great Easton feeling pretty chipper, although the mediocre speed had resulted in very little charge being pushed into the GPS, which grumbled away about a low battery. At Great Easton I found Paul, still pushing on with his two working gears. We ran the final 49km into the finish together (mainly using his GPS, whilst mine sucked on anything the dynamo threw towards it), managing a respectable 20.1km/h as we went despite the 430m of climbing. 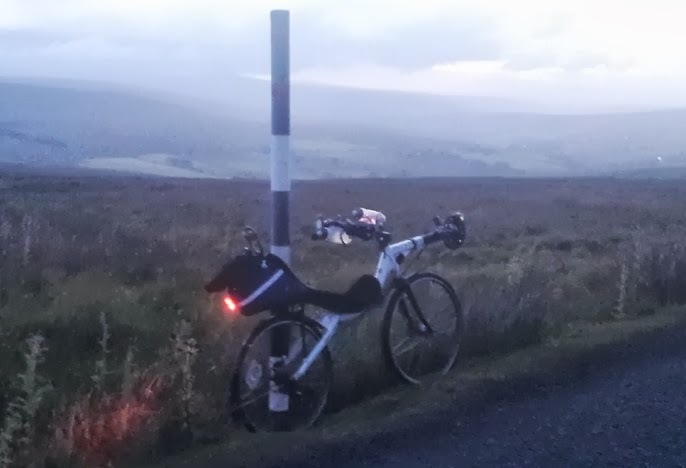 @Darkerside – #LEL2013 complete at 0220 this morning, with 2hrs 25 spare. Result. Finished. Logbook given its final few stamps and packed off to be sent to Paris for validation, medal received, food eaten, followed by a few hours sleep on the grass outside by the bike. A few hours later Paul and I rode the 20km or so into the centre of London, feeling slightly out of place amidst the morning commuter rush. I’m still not really able to get my head round what I’ve done, so a pithy and meaningful closing statement isn’t on the cars I’m afraid. The numbers just don’t fit in to any scale I can associate with a bike. I’m hugely proud, and equally hugely grateful to everyone who helped me reach the finish, including Laid Back Bikes for sorting out the MetaBike in the first place, all the volunteers who ran the event, the riders I rode with, those who sent encouraging messages on the way round, and a whole host of others. I didn’t ride LEL2013 for charity; I rode it to see if I could complete it. However, If you do want to donate money to a cause, please consider Yorkhill Children’s Charity. I have a page here explaining why I personally believe Yorkhill is work support, as well as a JustGiving page here. Thank you. The MetaBike, as it looked at Edinburgh. Cracking report, and a cracking ride. Congratulations! ThaNks for the report. Really great to finally hear (some of) the whole story. Don’t know how you did it, but well done! Wonderful report. Big applause for not panicking when you overslept. The route has changed since my LEL in2001 when it was a straight out and back from Eskdalemuir to Edinburgh. If you have ridden 1200k’s before, what did you think of the extra 200k? My final day was a blur, so tired. Oh, there was certainly a decent amount of panic, but given the way to resolve the issue was pretty clear it did focus the mind somewhat! My guilty admission is that prior to LEL my longest daily distance was around 150km, so I can’t really comment on how the extra 200 felt! I had a good chunk of adrenaline and caffeine keeping me going on the last day though – I was probably sleepiest coming down Yad Moss for the second time. Incredible effort and loved the report. I hope there was celebratory cake back in Glasgow. Off to make a donation to a very worthy cause. I rode with you for a while in the Howardian hills. You commented on my seriously low gear. Nice write up and interesting to see where your low was and how your controls times differed to mine in the earlier stages. Nice write up. Great report. Brilliant effort on the LEL. What were your thoughts on the metabike? Thanks all for the kind words. I’m going to write up a full ‘what worked, what didn’t’ thing over the next few days, so forgive me if I don’t try and cover it off here in the comments. 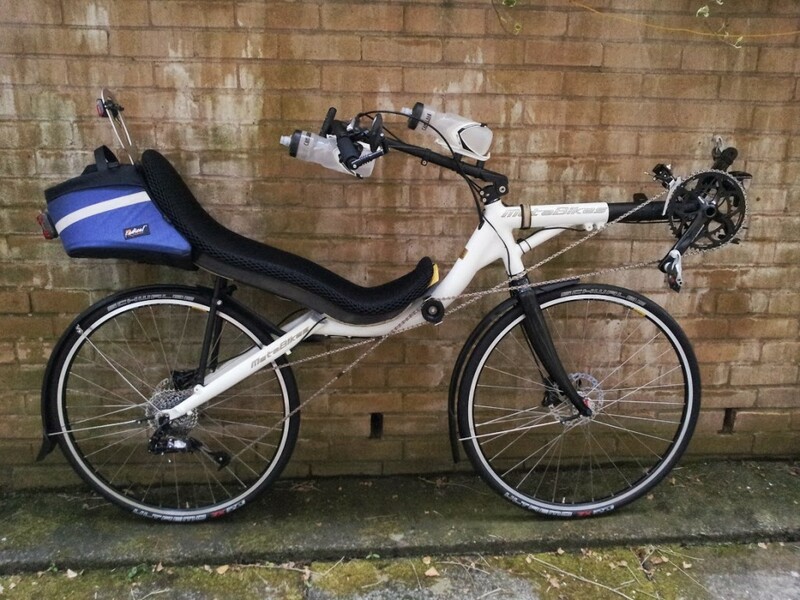 Similarly I’ll put up a proper MetaBike review in the near future. I’d like to get back across to Laid Back and give the 26″ version a second try. My current impression is that the handling is better with the bigger 622 wheels, but that might just be because I’ve put more hours in. 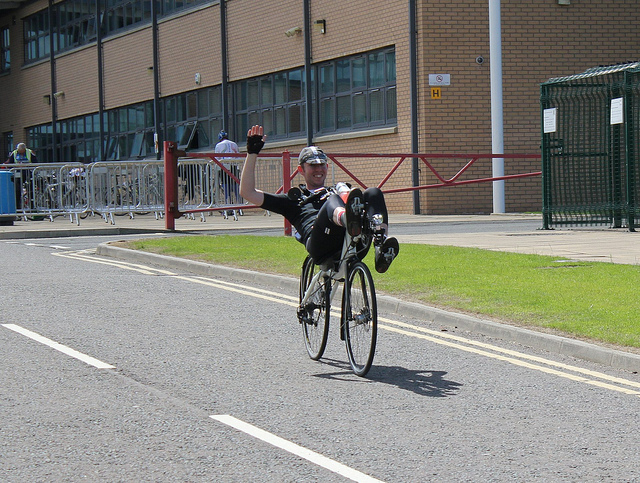 In short though, I would be pushed to think of a bike I’d rather have been on! Hi Phil! Sorry I forgot your name, it wasn’t a particularly alert time for my brain, clearly… Did you finish OK?